A thought provoking video parody has been released by The Center for Science in Public Interest to fuel its longstanding campaign to reduce the consumption of soda and other sugary drinks. 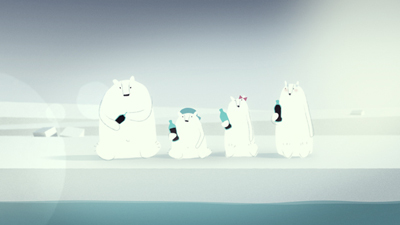 The video parodies the soda-guzzling polar bears featured in Coca-Cola commercials by featuring a polar bear family (The Real Bears) that suffer from the unhappy health consequences of consuming too much soda including: weight gain, diabetes, tooth decay, obesity, impotence and amputation. The Real Bears tells the story of a family of polar bears who, even in their distant Arctic environment, are not immune from sunny marketing messages from Big Soda. The whole family is consuming too much soda… and is experiencing everything from weight gain to tooth decay to problems in the bedroom. Only after recuperating from a terrifying visit to Doc Fox’s chilly surgical suite does Pop Bear come to realize that soda has brought nothing but sadness to his family. In the film’s stirring dénouement, he leads his family to reclaim their health—and their happiness. This video of The Real Bears is an interesting example of a parody, which is one type of fair use exception to the exclusive rights of a copyright holder. I don’t know that any challenges or copyright infringement claims have been made against “The Real Bears” video; however, the video provides an interesting opportunity to review the legal standards for a parody. When assessing whether a parody is entitled to fair-use protection under the U.S. Copyright Act, all four of the factors are to be analyzed and the results weighed together in light of the purposes of copyright. The purposes of copyright balance the exclusive rights of copyright owners and rights of the public including free speech, criticism and commentary of a work. FILM CREDITS: The film features an original song, Sugar, by Grammy-award winning singer-songwriter Jason Mraz which he wrote and performed with the San Diego-based rapper MC Flow. HEALTH FACT ABOUT SODA CONSUMPTION listed on the CSPI website: Soda and sugary drinks are the biggest single source of calories in the American diet, accounting for about 7 percent. See also, The Real Bears video at http://therealbears.org/#video; the website for The Center for Science in Public Interest at http://cspinet.org/new/201210101.html; the US Copyright Act at www.copyright.gov/title17/92chap1.html; another blog post on parody; @iplegalfreebies and www.kasterlegal.com. Criticism of a copyrighted work (which parody is one variety) is often a protected form of free speech. If a parody is challenged as being a copyright infringement, courts will conduct a “fair use” evaluation to determine if the parody is a permissible fair use for the purpose of criticism, commentary and preservation of free speech. Parody is generally a mocking criticism of another well known work. As you might have guessed, The Wind Done Gone is a parody of the famous American novel, Gone With The Wind. In The Wind Done Gone the plot follows the story line of Gone With The Wind but is told from the viewpoint of Cynara, a mulatto salve on the plantation who is Scarlett’s half sister and Rhett’s mistress. Cynara ends up being freed and continuing her life off the plantation. When The Wind Done Gone was published, a trustee for Mitchell (the author of Gone With The Wind) filed a law suit claiming copyright infringement and seeking an injunction to prevent the publication and distribution of The Wind Done Gone. The district court granted the injunction, which was appealed. The appellate court issued an order vacating the injunction on the grounds that it was unconstitutional and issued a comprehensive opinion in 2001 which held that The Wind Done Gone was a fair use parody of the novel, Gone With The Wind. Arguably exposure to the perspective offered on Civil War and slavery by The Wind Done Gone is a benefit of the First Amendment. Parody and the fair use exception are interesting components of US Copyright Law that highlight the balancing of a copyright owner’s exclusive rights and freedom of speech. See, “Suntrust v. Houghton Mifflin Co., 268 F.3d 1257 (U.S. App. 2001) and Suntrust v. Houghton Mifflin Co.,252 F.3d 1165 (11th Cir. 2001); US Copyright Act § 107 on Fair Use at http://www.copyright.gov/title17/92chap1.html#107 and http://www.copyright.gov/fls/fl102.html; The Wind Done Gone at http://www.amazon.com/dp/B0015MLOYI and Gone With The Wind at http://www.amazon.com/Gone-Wind-Margaret-Mitchell/dp/1416548947; @iplegalfreebies and www.kasterlegal.com. Following up on a post last month on a Hot Yoga Copyright Dispute… launched by Bikram Yoga to defend copyrights held in a sequence of 26 Hatha Yoga postures… The US Copyright Office has weighed in on the court proceedings and issued a letter stating that a Hatha Yoga sequence is NOT granted copyright as a work of choreography. You can breathe easy… in any Hatha Yoga sequence of your choice. Although, it appears that this lawsuit is still alive and moving forward since there are other non-copyright elements in the case. For more information: http://wp.me/p10nNq-fE on HOT YOGA dispute; http://www.dailybusinessreview.com/PubArticleDBR.jsp?id=1323647402672&slreturn=1; http://dockets.justia.com and http://www.yogatruth.org/; @iplegalfreebies and www.kasterlegal.com. Evidently Bikram Yoga is suing Yoga to the People (another Hatha Yoga establishment) for copying a sequence of 26 Hatha Yoga postures performed in a hot room (105 degrees) …claiming a violation US copyright law. Is this Copyright Infringement? Could be if the postures or the “routine of postures” are original. (It is possible to obtain copyright protection for choreography.) Although proving that a sequence of Hatha Yoga postures is original could be a challenge; since, Hatha Yoga is an ancient spiritual tradition with roots in India. It will be interesting to see how flexible the US courts and the Indian Government are with Bikram’s allegation of copyright ownership and infringement of the “Hot Yoga” sequence at issue. In a galaxy not so far away… (the United Kingdom under the rule of HRH)… the original designer and prop maker of the Star Wars stormtrooper costume continues to make replicas of the iconic stormtrooper in his basement and sell them over the internet. This basement stormtrooper-production-line led to a legal battle in the UK’s highest court. Lucasfilms filed a lawsuit for copyright violation, in the hopes of shutting down the basement production. The court ruled in favor of the basement stormtrooper-production since UK copyright law offers a short term of copyright protection for ‘props’ and that period of protection had expired. (Interestingly, the same stormtrooper costumes are covered by a much longer term of copyright protection in the UK if the court had found them to be works of sculpture instead of classified as props. Here in United States, if the stormtroopers were being produced in a basement on US soil… it is likely that Lucasfilms would have prevailed because, the US copyright law offers a much longer term of copyright protection regardless of the classification of the copyrightable work as a sculpture or prop.) Since the stormtrooper costumes are still under copyright protection in the US, damages may have to be paid to Lucasfilms for any costumes that were sold here in the US. 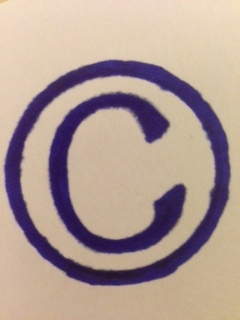 Copyright laws and the term of copyright protection vary from country to country. The case is: Lucasfilm v. Ainsworth, No. UKSC 39, U.K. Supreme Court. See also, http://www.supremecourt.gov.uk/news/latest-judgments.html; @iplegalfreebies and www.kasterlegal.com. The idea behind a piece of artwork is not protected by copyright. However, a near replica of an artist’s work in different medium can be a copyright violation if the new work closely copies a copyright protected work. What this means is that being inspired by an idea of another contemporary artist to recreate your own artwork from scratch is…100% legit. For example, if a famous photograph of the pyramids inspires you to fly to Egypt and try to recreate the exact same photo to display and sell in a gallery… there is no copyright violation. However, it is different if you use a copy of a famous photograph of a pyramid to paint a replica of the photograph. Painting a copy of a photograph changes the medium of the artwork, but it can often still be a copyright violation of the copied work. Obviously, there are many unique facts and factors to consider in each case… and many of these types of challenges settle before a court issues a final ruling. However by the time the parties begin negotiating a settlement, the stakes are higher and the alleged infringer generally ends up paying much more than it would have cost to secure a license at the outset. Rogers v. Koons, 960 F.2d 301 (2d Cir. 1992)( The infringers fair use defense was denied); Gaylord v. United States, 595 F.3d 1364 (Fed. Cir. 2010); Fairey v Associated Press; alleged infringement between A.Brown and littlewhitehead; alleged infringement between Burdeny and Leong; NY Times article 9/28/11, questioning originality of Dylan paintings at the Gagosian; @iplegalfreebies and www.kasterlegal.com.